Bax was born in South London, the eldest son of a nonconformist family. At the age of seventeen a love affair with all things Irish began after he read the poetry of Yeats: 'The Celt within me stood revealed'. Several of the important chamber works on this recording reflect this Irish love affair, the Elegiac Trio being a response to the tragic events following the Easter Rising in 1916. The serenade-like Nonet and Clarinet Sonata are deliciously 'heart-on-sleeve' works of yearningly lyrical melodies, while the oboe and harp quintets show Bax's pioneering enthusiasm for the precise sound of individual instruments in sometimes unfamiliar groupings. Arnold Bax wrote his first work for chamber ensemble in 1903 (a student string quartet) and his last in 1945 (his piano trio). In the intervening forty years or so, he composed a wide variety of chamber music ranging from sonatas with piano accompaniment (or in two cases with harp accompaniment) through trios, quartets and quintets to works for larger forces including a sextet with cor anglais, harp and string quartet; a septet (‘Concerto for Seven Instruments’) for flute, oboe, harp and strings; an octet with horn, piano and strings, and the Nonet presented here. The music on this recording was written at the very peak of Bax’s powers between 1916 and 1934. Bax is, of course, well known as the master of the romantic orchestra, developing a brilliant technique in the wake of the composers who wrote for Diaghilev’s Ballets Russes, particularly Stravinsky, Debussy and Ravel. Over nearly fifty years Bax wrote over eighty vibrant and colourful scores requiring the orchestra, including seven symphonies and a notable corpus of evocative tone poems. Yet while his chamber works do not always paint on quite the scale of his orchestral music, Bax composed with a sure ear for instrumental colour and atmosphere, a sensibility signalled most noticeably when he added the harp to his ensemble. In fact in his chamber music Bax was often writing for particular players whose technique, in the 1920s, coloured his instrumental technique. Thus when in the mid-1920s Maria Korchinska, a harpist trained in the long-standing Russian tradition, appeared on the scene (Bax got to know her in 1926 and 1927) Bax’s harp writing tended to change from the style he had earlier adopted when the English harpist Gwendolen Mason, trained in the French school, was his ideal. Thus, in the works here recorded, Mason would have informed the Harp Quintet, Korchinska the Nonet. Arnold Bax had been born in south London, the eldest son of a well-off nonconformist family. When he was twelve they moved to a Hampstead mansion standing in nearly four acres, an ambience that coloured the outlook of the Bax children for the rest of their lives. This was a house­hold dominated by the future composer’s indulgent and sympathetic mother: in fact she spoilt both her sons, possibly because a third, Aubrey, had died young. Arnold was a brilliant and talented musician, his brother Clifford a writer, and their teenage circle was of kindred spirits. Then came the Royal Academy of Music—for five years—followed by an enviable existence when, supported by a private income, he travelled, wrote music and poetry and lived the life of a somewhat bohemian, albeit well-heeled, artist: he was never to take a regular post. The romance of the west of Ireland came to Bax at the age of seventeen when he discovered the early poetry of Yeats. ‘The Celt within me stood revealed’, he later wrote, adding ‘now I was in love with Ireland and for the while needed no mortal mistress’, finding ‘all these faraway places were alike bathed in supernal light.’ He was soon visiting the far west, finding the remote Donegal village of Glencolumcille where he was to return regularly for nearly thirty years. This Irish side to his character is reflected in most of our programme. Yet it was not the escapist world of archetypal heroes and flaming sunsets that stimulated him to write these highly personal scores, but the dissolution of that dream on the streets of Dublin at Easter 1916; a political reality for which Bax was quite unprepared. His alter ego, Dermot O’Byrne, the name under which he published Irish poems, plays and short stories, came to the fore, and he produced a number of impassioned poems, nine of which were collected in A Dublin Ballad, a pamphlet which was banned by the British censor in Ireland and, although printed, was never published. Possibly his first reaction to the news, however, was his poem ‘The Irish Mail’, the train taking not only the post but also the British Army to Ireland. I read the place-names written there. Than all the long day's tenderness. Sundered till all this love is dead. The execution of Bax’s Irish friends and acquaintances, not least Patrick Pearse (Bax wrote ‘Padraig’), after the Easter Rising, engendered not only verse (‘For what last music did your thought await / That rainy morning in the barrack yard?’) but a succession of musical scores which, by eschewing close programmatic effects and melodrama, are all the more poignant. The first of these was the Elegiac Trio. Although dated ‘April–May 1916’ it was nearly a year before the Trio was performed, when it was given at London’s Aeolian Hall by Albert Fransella (flute), the composer H Waldo Warner (viola) and Miriam Timothy (harp) on 26 March 1917. This was only seven-and-a-half weeks after the same group had given the British premiere of Debussy’s late Sonata for the same unusual forces. The chronology of this work and the Debussy is interesting. Although to all intents and purposes Bax appears to be influenced by the Debussy, a comparison which must have been very striking to its first audience, it is unlikely that Bax could have known of the French score so soon. This was the first of three memorial works that Bax wrote in 1916 in the aftermath of the Rising. The others were the Irish Elegy for cor anglais, harp and string quartet and In Memoriam Padraig Pearse, an evocative orchestral tone poem. The Trio is undoubtedly imbued with Bax’s shocked reaction to the news from Ireland, though he gives us no clue as to its imagery, not even a dedication. He does not indulge in extravagant breast-beating, but rather dreams a dream of times long past, the flute and viola singing to the bard-like playing of the harpist. The Trio, though playing continuously, falls into two parts. By far the longer is the first, in which the viola and the flute sing against arpeggiated harp accompaniment, characterized by such markings as ‘sweet and expressive’. It includes several big statements given to the viola or flute and viola together. Of particular note is a spectral pianissimo episode launched by trilling flute and viola as the background to the harpist’s left hand playing harmonics in unison with the theme in the right. In the much slower closing section, almost foreshadowing the epilogues of some of the symphonies, the viola and the right hand of the harp sing a noble elegy accompanied by flute patterning and roulades and harp arpeggios. In 1919 Bax returned to Ireland, probably for the first time since the War. His play, The Grey Swan, and the second Piano Sonata were surely stimulated by that visit, and it is probable this Quintet was, too, evocative of revisiting familiar places and people Bax had known. The Quintet is in one movement, and of its two principal themes the first four notes of the first constitute a motif which recurs in the second. As in all Bax’s work with harp, the quality of the actual sound is important, and a climax early in the piece, molto vivace, for tremolando strings, for example, is orchestral in effect. In a later passage muted strings are contrasted softly with the tone colour of the harp, while occasional use of harp harmonics adds to Bax’s varied and colourful palette. Although written in 1919 this striking score was not first performed until February 1921, when the string quartet was the Philharmonic Quartet to whose violist, Raymond Jeremy, it is dedicated. 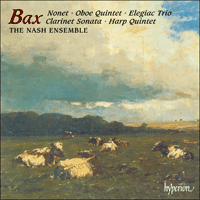 In its day Bax’s Oboe Quintet was pioneering, for the oboe quintet was an unfamiliar form at the time. Bax was, of course, influenced by the playing of the celebrated oboist Leon Goossens, then in his mid-twenties, to whom the Quintet is dedicated, and Bax was probably the first big name composer to write such a piece for him. Goossens’s distinctive artistry informed the writing of a generation of British composers, certainly Bax, and he later conceived the oboe part in his Nonet with Goossens in mind. Bax wrote his Quintet very quickly, between the completion and the first performance of his epic first Symphony, in the autumn of 1922. (The Quintet’s first movement is dated 1 November, all was completed by Christmas.) In a work ending with an Irish jig, Bax is again reflecting his engagement with Ireland. Moreover, Bax is surely no musical tourist here for the first two movements have the mood and atmosphere of the Irish songs that he had written earlier the same year, songs of more note for their heart-broken sorrow than their picturesque colour. After an elegiac progression of chords, the oboe’s first entry, an improvisatory tempo molto moderato, has a plaintive cast, indeed surely the reminiscence of Peter Warlock’s despairing cor anglais in The Curlew is not far away from this music. The central section is vigorous, some commentators even finding it ‘rustic’, but Bax is certainly not evoking Irish folk music, as he is in the finale. The range of colour Bax extracts from his string quartet is amazing, at the outset having the first violin playing tremolando in octaves with that characteristic sound that comes from playing close to the bridge, the cello and viola playing pizzicato and the cello declaiming a bold repeated motif. Soon, while the oboe plays an upward-lying phrase unaccompanied, the strings quickly put on their mutes for the return of the opening, much transformed. The ending is magical as the strings play soft chords underpinned by threatening repeated Gs on the cello and a final distant flourish from the oboe. The mutes are off for the slow movement which is the emotional heart of the work. It opens very quietly with a serenely beautiful folk-sounding tune sung out molto espressivo by the first violin, warmly accompanied by the strings. Eventually the oboe sounds a plaintive improvisation, reminding us how Bax once unexpectedly heard pipe-music in a London street and asked, in a brief verse, ‘What aged war wouldst thou awake in me, / Thou subtle world-old bitter Celtic voice?’. This plangent tone contrasts poig­nantly with the beauty of the opening and is underlined and elaborated by the strings and oboe now together. Eventually the opening tempo returns and with it the violin’s opening tune, now clouded by troubled shifting string textures, and the spectral effect of the first violinist’s sul ponticello tremolandi. Even the oboe’s serene closing phrase is shadowed by the soft tremolando strings, and an uneasy repose is not achieved until the final chord. The finale is an Irish jig, written by a composer who had seen and taken part in the real thing, though as far as is known the authentic-sounding themes were composed by Bax himself. Yet all too soon clouds cover the sun and the spectres return. The dance continues and although the ending is thrown off brilliantly we are aware that this is no mere Irish picture postcard. In 1922 no one, certainly not Bax, could fail to be torn by the horrors, the terror and the infinite sadness overshadowing the picturesque scene. A final enigma. Does Bax quote a real folk-song in the finale when what sounds like the opening of the slow movement of Brahms’s fourth Symphony makes a vigorous appearance? This idea also appears in Stanford’s Irish Symphony, and the debate as to its origin has never been satisfactorily explained. What is quite certain is that Bax did not take it from Brahms, a composer he never warmed to. The Quintet was not played until May 1924, when Leon Goossens and the celebrated Kutcher Quartet gave it at London’s Hyde Park Hotel, in a concert promoted by Mrs Adela Maddison. For some this outgoing score is serenade-like, yet it surely also reflects the third Symphony, and—particularly when heard in the analytical climate of the recording studio—the parallel between the sound world of the Nonet and the third Symphony, with which it is absolutely contemporary, is striking, albeit the Nonet has for the most part a more relaxed and sunnier character than that epic score. It was first conceived as a two-movement Violin Sonata, completed in September 1928 (it would have been his fourth), but it remained unperformed. When, in 1929, as one of the leading composers of the day, Bax was commissioned to produce a work for the 1930 Bradford Festival, he re­scored it for flute, oboe, clarinet, harp, string quartet and double bass, completing the score in January 1930. It was first heard at Bradford on 30 September. The second performance is also of interest for it was a private concert in memory of the pianist Harriet Cohen’s brother, Eric Verney-Cohen, to whom, when it was published, it was dedicated. The first movement, in sonata form, starts with the viola playing a flowing ostinato—later on clarinet—over which the oboe is heard with what Bax referred to as ‘the main subject of the work’. Two more ideas are introduced and, in Bax’s words, they are ‘worked out with increasing passion’. Finally an emphatic allargando brings us to a violent re-assertion of the ostinato figure. The tempo becomes a real allegro for the first time and the main subject is ‘tossed about between the various instruments as if blown by a storm’. There remains a short coda derived from the ostinato and the third theme. The second movement starts with the statement of two ideas, one on the clarinet in semiquavers, the other in chords. Later follow two others. A gradual climax leads to further development of the first theme after which the third predominates, as Bax said ‘in an ever darkening mood’. Bax referred to the lento expressivo coda as ‘an idyllic epilogue’ in which returns the first subject of the first movement now informed by elements of the fourth idea from the second movement. The Clarinet Sonata, completed in June 1934, is another serenade-like score and, so far as is known, was not informed by any non-musical imperative. It was written for Hugh Prew, a fellow-cricketer with Bax in his brother Clifford’s ‘Old Broughtonians’ team who played village cricket over the west country in the 1920s. At its first performance in June 1935 it was played by the celebrated clarinetist Frederick Thurston, whose distinctive playing influenced a decade of fine works for clarinet of which John Ireland’s Fantasy Sonata is probably the best-known. Bax’s Sonata is in two movements and is largely lyrical in intent, the piano always playing a significant role. Two subject groups, each consisting of a theme and a subsidiary ‘tail’, are introduced, the first returning to round out the exposition. Both are elegiac, the first heart-on-sleeve, the second more introspective because more chromatic. Development and recapitulation merge almost indistinguishably, the latter extensively elaborated before the opening theme returns to round out the movement in twilight mood, all pink dusk and sunset shadows. The shorter second movement opens in contrasted moto perpetuo style with a brilliant scherzando theme and associated passage-work, later contrasted with a yearning lyrical melody, before this delicious score ends with the return of the theme of the opening and dies away to a quiet, contented close.